HSENI has become aware that a number of manufacturers/suppliers are marketing an extendable scaffold loading bay gate that does not satisfy legal requirements or applicable standards when in some configurations. 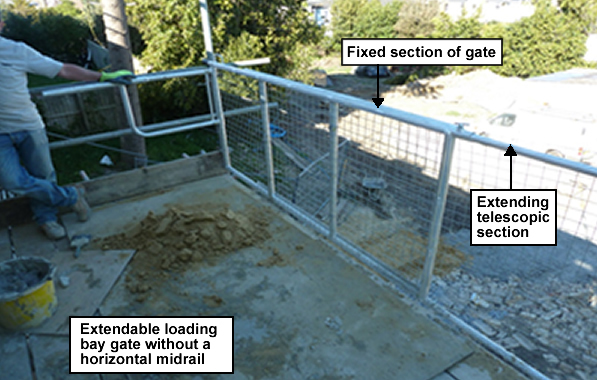 When extended the loading bay gate, which forms part of the edge protection on a scaffold, is not robust enough to fulfil this function and is therefore not suitable and sufficient to comply with the Work at Height Regulations (NI) 2005. This safety notice applies to all similar types of loading bay gate as described below. The loading bay gates subject to this safety notice originate from a variety of manufacturers/suppliers and comprise two panels made up of tube and mesh (see photo 1). One panel section is fixed length and the other is telescopic and can be adjusted to the required width of the loading bay. This allows a width adjustment from approximately 2300mm to approximately 3900mm. The mesh infill spans the full width and height of each panel. There is no horizontal mid rail. This loading bay gate design is reported to be available in steel and in aluminium. The mesh infill is typically 3 mm gauge on a 50 mm square pattern and each edge is welded to the fixed length panel. To allow the telescopic panel to slide during adjustment the mesh on this section is loose. Supplier instructions seen suggest the loose mesh should be fixed to the gate perimeter using plastic cable ties after this panel has been telescoped to a width suitable for the loading bay. This type of gate has been found on a number of construction sites where the mesh was loose and able to detach when pushed (see photo 2) so would not be able to resist a person leaning or in particular falling against it, and would also allow loose materials to fall from the platform. The gates in question open by rotating upwards around a pivot fitting mounted approximately 500mm inboard of the gate (see photo 3). Because this type of gate has very short rear levers it is usually opened by lifting the handles on top of the gate, placing a worker right at the edge of the platform with a gap beneath the gate that can exceed 1.5 metres high. When fully open there is a gap beneath the gate of approximately 1 metre height although this is about 1 metre inboard of the open edge of the loading bay (see photo 3). The Work at Height Regulations 2005 Schedule 3 requires edge protection used for construction purposes to be of suitable strength and rigidity and to comprise the equivalent of a top rail, a mid-rail and a toe board. Where no mid rail is present any mesh panels or similar must be able to achieve an equivalent level of containment. This safety alert does not apply to designs of upward rotating loading bay gate that are robust and are operated from the rear of the loading bay and which close off access to the loading bay when the gate is open. These should already comply with BS EN 12811-1:2003 ‘Scaffolds – Performance requirements and general design’ which sets out the standards expected for loading bay gates. For gates of the type described in this safety alert stainless steel cable ties will be accepted as an interim measure for securing the mesh panel, and should be installed to the gate supplier’s instructions. Typically this will be one cable tie per 300mm. Unless the gate manufacturer/supplier allows a lighter duty cable tie, ties rated at minimum 75kg loop tensile strength should be used. Note that most cable ties are not designed to be suitable for reuse following loosening or removal. Alternatively, this aspect of the safety alert can be complied with by installing the extendible gate in the fully closed (narrowest) configuration thereby not requiring the use of cable ties. Stainless steel cable ties should be included as part of the 7 day scaffold inspection. Options to allow the gates in question to be opened without workers being able to slip or trip and fall through the gap underneath the open gate or the large gap while opening the gate include remote opening using rope over a scaffold rail or pulley fixed above and inboard of the closed gate. Or moving the gate pivot further inboard and extending the operating levers - this may remove the need to fully rotate the gate during opening. Both these methods allow operation from the rear of the loading bay platform - ie at least 2m back from the open edge. HSE has been informed that the supplier of one model of the gates in question is working on a design change to bring the gate to a standard that meets EN 12811-1 during operation and use. HSENI expects all manufacturers/suppliers of similar gates to do the same. 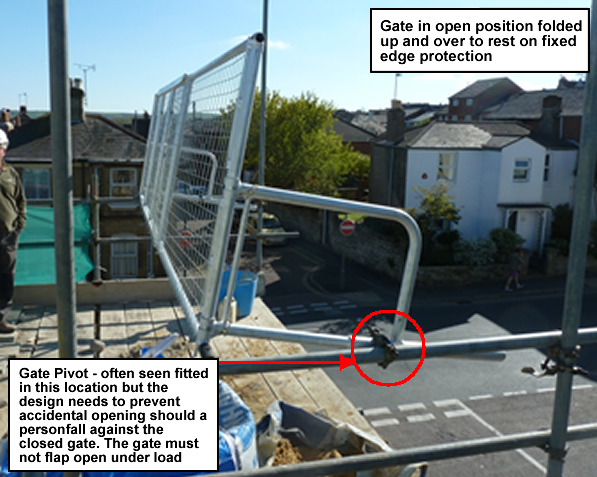 These improvements will need to address the securing of the mesh infill panels; the risk of the gate opening due to a person or materials falling against it; and the level of fall protection provided when the gate is operated or open. Cable ties are not a permanent solution, However it is appreciated that many of these gates are manufactured and shipped from overseas and that changes will take time to implement. HSENI will accept the correct use of stainless steel cable ties as an interim measure until the end of December 2016. After that date Enforcement Notices will be considered on a case by case basis for inadequate gates and/or gate designs. During the interim period gate installations that do not meet the minimum standard set out in this document will be subject to appropriate enforcement action. Safety Guidance SG 33:14 Guide to the construction and use of scaffold loading bays and loadbearing platforms. Note: the NASC is currently reviewing its guidance in relation to loading bay gates and preventing falls in scaffolding. The Scaffolding Association has stated that it intends to produce guidance on loading bay gates. 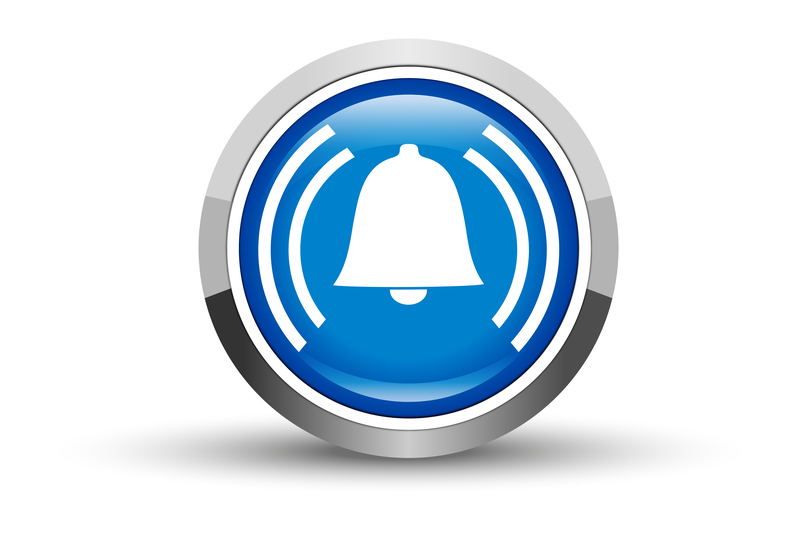 More information about this safety alert is available on the HSE (GB) website.